New strain of lab mice mimics human alcohol consumption patterns ~ Health Matters Today! A line of laboratory mice developed by a researcher from the School of Science at Indiana University-Purdue University Indianapolis drinks more alcohol than other animal models and consumes it in a fashion similar to humans: choosing alcohol over other options and binge drinking. Animal models previously available to alcohol abuse and alcoholism researchers do not get as drunk as the new strain, unless alcohol is the only choice of fluids, or alcohol is administered by the experimenter. When given the option, previously bred mouse lines continue to drink water even when they can select alcohol. These new mice, selectively bred over 40 generations at the School of Science at IUPUI to prefer alcohol over all other choices, will help researchers explore new aspects of the behavioral and genetic determinants of alcoholism. In a study published online ahead of print in the journal Addiction Biology on Nov. 29, senior author Nicholas Grahame, associate professor of psychology in the School of Science at IUPUI, reports on the mice he has bred since 1997. 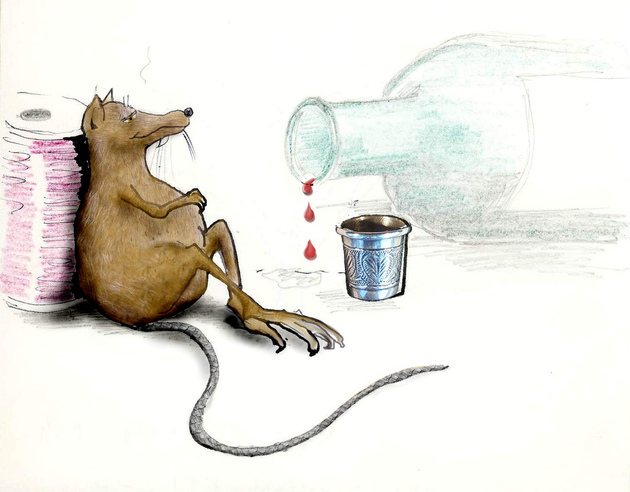 The rodents reach blood-alcohol levels of more than 260 mg/dl of alcohol daily, over three times the equivalent of the human legal driving limit and the approximate consumption level that the severest human alcoholics attain. "The free-choice drinking demonstrated by the new mouse line provides a unique opportunity to study the excessive intake that often occurs in alcohol-dependent individuals and to explore the predisposing factors for excessive consumption, as well as the development of physiological, behavioral and toxicological outcomes following alcohol exposure," says Grahame, who is a biopsychologist specializing in alcoholism. According to the National Institute on Alcohol Abuse and Alcoholism, part of the National Institutes of Health, an estimated 17.6 million Americans abuse alcohol or are alcohol dependent. Alcohol abuse and alcoholism can be treated but cannot be cured. Mice share 80 percent of their genes with humans, so they are an excellent model to study alcoholism, a disease with a strong genetic component. The risk of developing alcoholism is known to be influenced by lifestyle. Animal models allow researchers to employ methods that they are unable to use in humans. "This line of high-alcohol-seeking mice should be able to give us a better understanding of the basic brain mechanism involved in alcohol consumption as well as greater insight into the toxic effects on the brain, with the goal of developing therapies," said Grahame, whose research focuses on behavioral genetics and behavioral pharmacology. As with humans, the mice become intoxicated when the pace of alcohol consumption is faster than the liver can eliminate it. Typically it takes six or seven hours of continuous alcohol drinking for the new strain of mice to reach the highest levels of intoxication. Doctoral candidate Liana M. Matson is a co-author of the study. She has conducted research focusing on when the mice drink and determined that they are nocturnal drinkers. This knowledge enabled the mice's blood-alcohol levels to be tested when at their highest level. Undergraduate School of Science students Amy Buckingham and Nick Villalta assisted in the research by measuring intake and blood-alcohol levels in the new strain of high-alcohol-seeking mice. In a related study, they analyzed how drunk the mice became by testing how the animals performed on a balance beam. Development of the mouse line and the Addiction Biology study, "Pharmacologically Relevant Intake During Chronic, Free-Choice Drinking Rhythms in Selectively Bred High Alcohol-Preferring Mice" were funded by NIAAA and the School of Science at IUPUI.